Cameroon has banned public meetings and travel in a mainly English-speaking region ahead of a protest to demand independence for the area. The South-West region's border with Nigeria has also been shut to block "infiltration" by people threatening Cameroon's unity, officials said. Pro-independence marches have been planned for Sunday, the 56th anniversary of Cameroon's unification. English speakers accuse the Francophone majority of discrimination. They say they are often excluded from top civil service jobs, and that the French language and legal system have been imposed on them. The government denies the allegations and insists that it treats all citizens equally. Why did Cameroon block the internet? Following a referendum, British-run Southern Cameroons joined the French-speaking Republic of Cameroon in 1961. It is now divided into the South-West and North-West regions. Demands for independence have grown in the two regions in recent years and tension has been escalating ahead of Sunday's planned protests, reports the BBC's Randy Joe Sa'ah from the capital, Yaoundé. 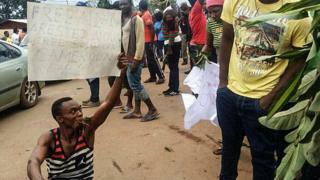 The South-West region's governor, Bernard Okalia Bilai, has called protest organisers "dogs", and has warned them that they will be met by troops if they take to the streets on Sunday, our correspondent adds. At least six protesters were killed and dozens arrested during protests earlier this year. Access to the internet in the Anglophone regions was also blocked from January to April. Announcing the new security measures, Mr Bilai said there would be a ban on gatherings of more than four people, and travel between towns, from 20:00 GMT on Friday until 08:00 GMT on Monday. The region's border with Nigeria would also be closed during this time "following persistent threats of destabilisation" by individuals based outside Cameroon, he added. In a statement on Thursday, the UN said Secretary-General António Guterres was concerned about tensions ahead of Sunday's protests. He urged Cameroon's government to address the grievances of its Anglophone population, and to take steps to promote national reconciliation, it said. "The Secretary-General supports upholding the unity and territorial integrity of Cameroon and urges all parties to refrain from acts that could lead to an escalation of tension and violence," the statement added.